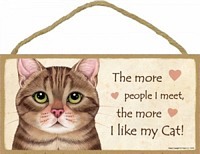 Approximate size is 5" x 10" wood plaque sign. Features the artwork of Blackwater Trading. 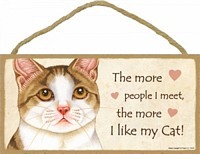 Cat wood plaques that are USA made. 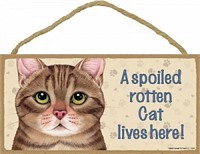 A spoiled rotten cat lives here depicting a brown tabby cat. 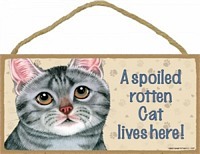 Approximate size is 5" x 10"
A spoiled rotten cat lives here depicting a grey tabby cat. 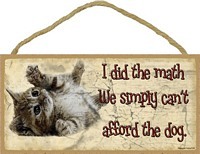 The plaque is made from Laminated Cardboard and includes a hole for easy hanging. 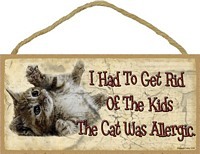 Pet sign with "In Case Of Emergency Please Save My Cats". Sign includes suction caps to attach to a flat surface. Make Emergency Services aware to save your animals in case of a fire or other disaster.